Casbah is a rich, leather-incense fragrance (it would fit in perfectly with the Comme des Garçons incense line). As I sniff Casbah, I detect pepper, nutmeg, smoke and vetiver (while wearing Casbah, the spice notes sometimes blend with the incense smoke to create the aroma of an exotic, well-spiced dish cooking on a hearth). Casbah is a well-blended incense fragrance; the note that stands out most forcefully is leather (a smooth, semi-sweet leather). As I wear Casbah, I notice a shift from the early “food-y” stage of the fragrance to a more “churchy” incense scent near the end of the perfume’s development. Casbah dries down to slightly bitter, talc-y incense ash. Casbah is a fine incense fragrance, but at this stage of the perfume game, fine incense fragrances are a dime a dozen (or more like $1440 a dozen). Robert Piguet Casbah Eau de Parfum is $150 for 100 ml; for that price you could buy two of the quirkier Comme des Garçons incense fragrances. For buying information, see the listing for Robert Piguet under Perfume Houses. Nasomatto has just launched Pardon by perfumer Alessandro Gualtieri. Pardon is an oud fragrance with additional notes of chocolate, tonka bean, cinnamon, ‘flowers’ and sandalwood. Pardon presents a streamlined, smooth/sweet interpretation of decidedly UN-raw “oud”; Pardon’s oud has been scrubbed of its medicinal aspects and what muskiness there is in the fragrance is vegetal in nature, not animalic. Pardon’s rich scent of “tailored” oud is accompanied by a hint of underlying “smoke” and dessert notes: some creamy vanilla/tonka and a touch of (almost “cool”) cinnamon/clove. Finally, in the base, there’s clean patchouli and wood notes (reminiscent of those in Van Cleef & Arpels Bois d’Iris). I don’t detect flowers in Pardon…no matter how many times I’ve tried it. If floral notes are present, they are submerged under the heavier oud-spice-wood notes to the point of invisibility. Pardon isn’t as striking as other Nasomatto perfumes I’ve enjoyed (Black Afgano) or loved (China White); the overall scent of Pardon is not unusual or “new,” but good. Pardon is a pleasant, well-made wood-oud fragrance, suitable for men or women, and perfect for cool weather wear. Pardon has mild sillage, but it’s ‘dense’ and it lasts and lasts on skin. Pardon’s density is my main quibble with the perfume; the fragrance could have used a ‘spark’ or some ‘fizz’ to rouse it from its sleepy, too-comfortable mood. Nasomatto Pardon Extrait de Parfum is $165 for 30 ml; purchased from the Nasomatto website you can get 4 ml for 38€ (and save about $15 on the 30 ml bottle, even with shipping costs). For other buying options, see the listing for Nasomatto under Perfume Houses. Linari Fuoco Infernale (Purgatory), by perfumer Egon Oelkers, includes fragrance notes of myrtle, carnation, marjoram, bouleau absolue, labdanum extract, cinnamon, wormwood, iris, tonka bean, olibanum, amber, white musk, leather, cedar and gurjun oil. In mid-development, Fuoco Infernale becomes ‘hazy’, producing a pleasant fog of clove and sweet woods (especially birch); I LOVE this phase. I braced myself for disappointment as the fragrance wore down because the moment I saw “white musk” in the ingredients list I had ‘scent visions’ of fresh laundry flapping on the cedar and birch trees. It doesn’t happen…no smarmy white musk arrives to ruin the perfume. The last phase of Fuoco Infernale smells of summery sweet clover tinged with ‘clear’, tonka-dusted amber. Linari Fuoco Infernale Eau de Parfum is the most interesting and complex of the perfumes reviewed here today, and the only one that has tempted me to buy it. 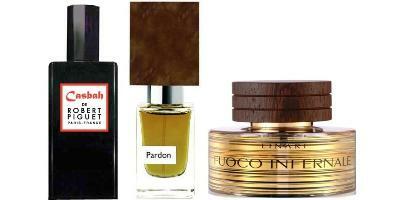 Fuoco Infernale is 140€ for 100 ml; for buying information, see the listing for Linari under Perfume Houses. Three perfumes down…thirteen more to go! Not to quibble, but only for fun, I would understand Fuoco Infernale as hell fire or infernal fire rather than purgatory. The fragrance makes hell sound like a pretty pleasant place. Relaxing. Cozy. And certainly not too hot! And not to quibble back (really!) but only because I checked…the official name of the fragrance is “Fuoco Infernale (Purgatory)”, although admittedly that wording appears in some of the Linari materials, and others just call it “Fuoco Infernale”. Thank you for the clarification-I had assumed the parenthesis was Kevin’s. Still, if that’s purgatory, I might be happy just to stay right there. PS: Others in the “religious” series are Angel of the River and Holy Water. Need to try them all now! These all sound tempting, Kevin. In particular, the Fuoco Infernale is calling my name. I’m sure I’ll sniff the Nasomatto as well with a nose to autumn. Thanks! I love your new avatar- its gorgeous! The only one of these I’ve tried is Pardon, which had a little too much patchouli for me. But the Linari sounds great—I don’t even remember hearing of this line before. I: it was a line I ignored till recently…too many lines! So happy to see a review of one of the new Piguets! If my experience with Casbah proves to be anything like yours, Kevin, it will be joining select members of the CdG incense series on my dresser. Even if fine incense fragrances are a dime (or $1440) a dozen, I still want them all. ALLLLLLLLL. And Fuoco Infernale got my attention, too. Is it weird if I say that Purgatory is calling my name? hajusuuri: Ah, I know the feeling…too many months without a purchase and the Danger Zone is reached. I have to wear this again after reading this review. I bought a full bottle of this blind based on Linari’s PR material and the name. I can’t resist the name. I found it a bit challenging to wear, although I definitely thought it was a well crafted fragrance. Eau: the names are good…curious, what did you find challenging about the perfume? I don’t have a sophisticated nose. FI is a blast of an uknown concoction to me. It’s not fruity, it’s not citrusy, it’s not spicy nor woody. It’s indescribable. It evoked none of those positive feelings you mentioned. The Linaris have been at beautyhabit for months, I was wondering when/if we’d see any reviews. Thanks, Kevin! KR: it’s a miracle I got to the Linari as fast as I did! I was so excited to see Casbah reviewed. It looked so exciting and I will still test it, but I certainly will not do a blind buy after reading this. Terrific reviews and great fun reading! BC: hey, stop that blind buying! Sounds like i would like the Piguet the most based on your review. Haven’t tried any from the Linari house because i used to consider them out of my price range. A really informative review. I will try and sample some on my next shopping trip and try and see if I can smell some of the elements you describe so well. I love the Piguet bottles, so like the reader above might have been swayed into purchase. Your review has made me more circumspect. I will have to sniff Casbah, since I never tire of those kinds of incenses and I just love Guichard. Trebor: the Nasomatto bottles DO need a redesign…I’ve heard several complaints about leaking/messy nozzles and wonky caps.